Houseleek and honey as a medicine achieve excellent results for the treatment of fibroids and cysts in the uterus. This medicinal combination is a known folk recipe, but not the only one that we will share with you in this article. As most effective proved to be the houseleek tea, ointment, tincture, wraps and unavoidable fresh juice from fresh leaves. These natural remedies are effective for the treatment of ear infections, bronchitis, and skin problems, against corns, eliminate anxiety and stress, and relieve menstrual problems and many more. Houseleek and honey are unavoidable in phytotherapy and are certainly worthy of attention. Houseleek plant got its name after the old beliefs that it can save the house from fire, lightning, evil forces and other negative phenomena. We do not know whether it protects against lightning and fire, but it has been proven that houseleek prevents and cures many diseases and thereby maintains good health. It is a very resistant species, which further describes its Latin name Sempervivum, which means "always alive". In some places under the above mentioned evil forces vampires, witches and many other negative phenomena are mentioned, which we will not deal with, because these are topics more intended for any psychic-wizard's portal, which we certainly are not. Houseleek and honey are just one of the many recipes that are worth mentioning because they are effective for stomach and will contribute to better health in general. Other folk names for this plant include: janitor, the guard, etc. Houseleek leaves are harvested from March to October, although most medicinal and most effective this plant is during summer and its valuable composition does not change even after freezing. If grown in a pot, you can pluck it the whole year. For cultivating houseleek it is important to say also that this perennial plant can grow up to 30 cm and is resistant to low and high temperatures, especially in the drought, because she favours the sun. It grows almost everywhere, on the walls, between the stones, on very different soil types, even on the roofs of houses, and can be grown and potted. Wherever it is planted, you will not go wrong - you will have a delightful decoration and natural remedy at hand. Houseleek colour varies from green to burgundy and purple, leaves are in the form of rosettes, while the flowers are formed at the top and are usually red in colour. This herb contains tannin, fatty oil, plant mucus, resin, calcium malate, malic and formic acid, and in folk medicine as a remedy houseleek was used because it has a diuretic and anti-inflammatory properties and ability to tighten the skin and mucous membranes. The plant is used as juice, coatings, grease, tincture, tea and is especially effective combination is honey and houseleek and it helps in the treatment of cysts, uterine fibroids, inflammation of the ovaries, etc. Houseleek plant has extraordinary therapeutic action in the event of ears illnesses. Our grandmothers dropped the houseleek leaf juice in the ear in order for unpleasant pain to stop. The juice from the leaves of the plant dissolves excess resin in the ear and relieves pain and helps in case of hearing loss. Many were convinced of the efficacy of this folk medicine, and today even some paediatricians recommend the use of houseleek in cases of ear infections. Treatment is carried out so as to squeeze 2-3 ml of juice from the leaf, drip it into the ear, wait for a while to settle and after a few minutes let the houseleek juice leak from the ear. Suppose also that the pain in the ears is one of the most embarrassing and most unpleasant ones that we can feel. Houseleek for ears is certainly remarkable and welcomed assistance in the aforementioned pain, but also for dissolving the resin because it solves a problem with hearing loss. This excellent remedy and prescription of houseleek and honey should not be forgotten, but should be preserved from oblivion, for future generations to come. The answer is quite simple. 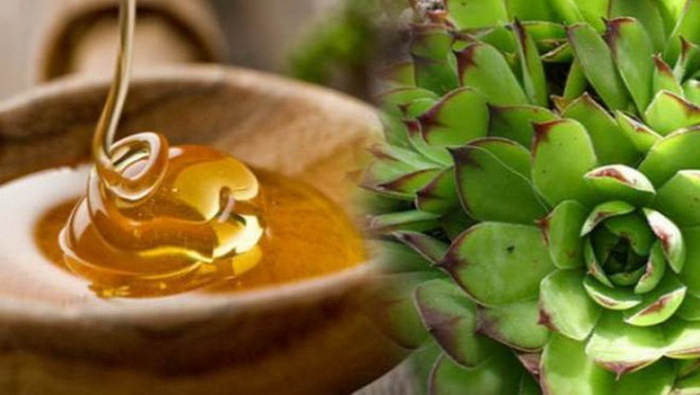 Houseleek and honey are a remedy for cysts and fibroids, houseleek juice for ears of which we have already discussed, for skin problems, against bronchitis, anti-anxiety and stress. Houseleek plant has a similar effect as aloe, which is known in the treatment of various skin disorders. Thanks to its anti-inflammatory and antiseptic properties, it is an excellent first aid against burns, bites and insect bites, it provides quick relief and is a tranquilizer. Houseleek can treat corns, freckles, wounds and sores on the skin, warts on hands, herpes zoster, and hard skin on the soles of the feet - simply by coating the troubled area of freshly squeezed juice or putting a coat of severed leaves. Houseleek juice helps in case of bronchitis, sore throat, purulent angina, abscesses and tooth infections, and malignant diseases of the oral cavity. It is believed that houseleek plant neutralizes harmful energy, relieves stress and consequences in response to weather changes, helps with the healing of diseases, stabilizes and calms the nervous system and increases our ability to work. It is an extraordinary panacea, which can be used with different problems and health problems. Houseleek and honey remove cysts, fibroids, treat problems with the stomach caused by Helicobacter pylori, strengthens the immune system, alleviate problems with the thyroid gland, facilitate digestion, improve digestion, eliminates constipation and regulates the problem with constipation, inflammation of the mucous membrane of the lens and many other diseases and ailments. 300 grams of juicy houseleek leaves grind in the meat machine or a blender and mix with 500 grams of a good quality local honey. Put in a glass jar, wrap in foil and let it stand covered in the refrigerator. Honey and houseleek as the drug are taken in the morning on an empty stomach, one tea spoon and you should not eat nor drink anything for half an hour. The greatest merit of this natural remedy is to detoxify and cleanse the body of accumulated harmful toxins. There is no better and healthier recipes to accelerate metabolism than the houseleek and honey, and are beneficial after heavy meals, after abundant feasts, and celebrations, when we usually overdo it with food and drink and in every other way. HOW TO MAKE HOUSELEEK TEA? For houseleek tea it is known to be used in the case of menstrual cramps and the heavy menstruation, ulcers and diarrhoea. You prepare it: 10 grams of fresh or 12 grams of dried houseleek cook for about 15 minutes in 2.5 ml of water. After that filter it and allow it to cool. It is drunk in a cup of tea in the morning on an empty stomach, and then every hour one tablespoon of tea. With prescription of houseleek and honey, this is one of the most effective and most used recipes in traditional medicine, when it comes to this plant. Suppose also that houseleek and honey are a very tasty combination that will appeal to many. What is best in this national recipe is that you can consume it without any prior confirmation or the diagnosis by doctors and experts. In fact you can use it as a completely healthy person, then it will act preventively and help prevent a number of diseases. This mixture will prevent further decline in immunity because it contains some of the best ingredients that nature gives us and that is particularly effective together in synergy.